A former 18th Century Palace, Arai Aparthotel (as its name suggests) is part hotel part apartments which features kitchens in all the rooms and that encourages longer term stays. 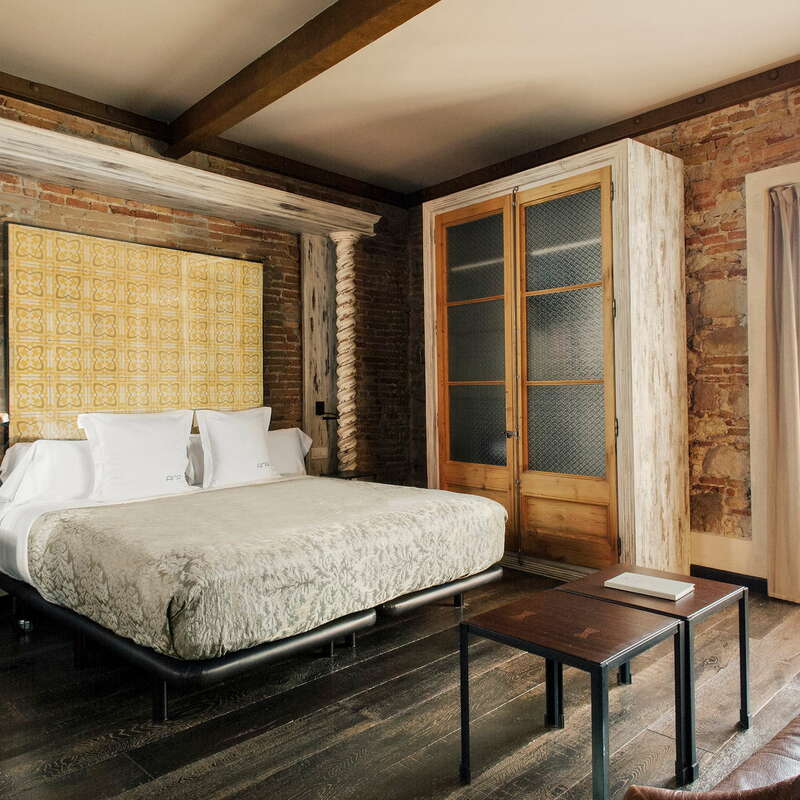 Perfect for families, the property harkens back to its roots with reclaimed wood, ancient stone walls, and original frescoes. Despite its age, modern amenities abound, as this hotel was opened in 2010 and features high-end luxuries and services, great dining outlets, and a beautiful rooftop pool. 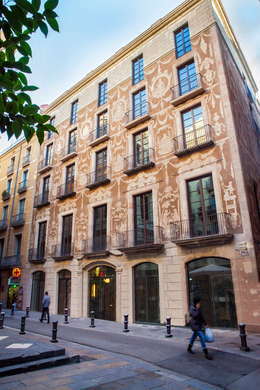 Guests who stay here also get free entry to the Egypt Museum of Barcelona. Rooms come in a variety of shapes and sizes in accordance with government rules over historically preserved properties. 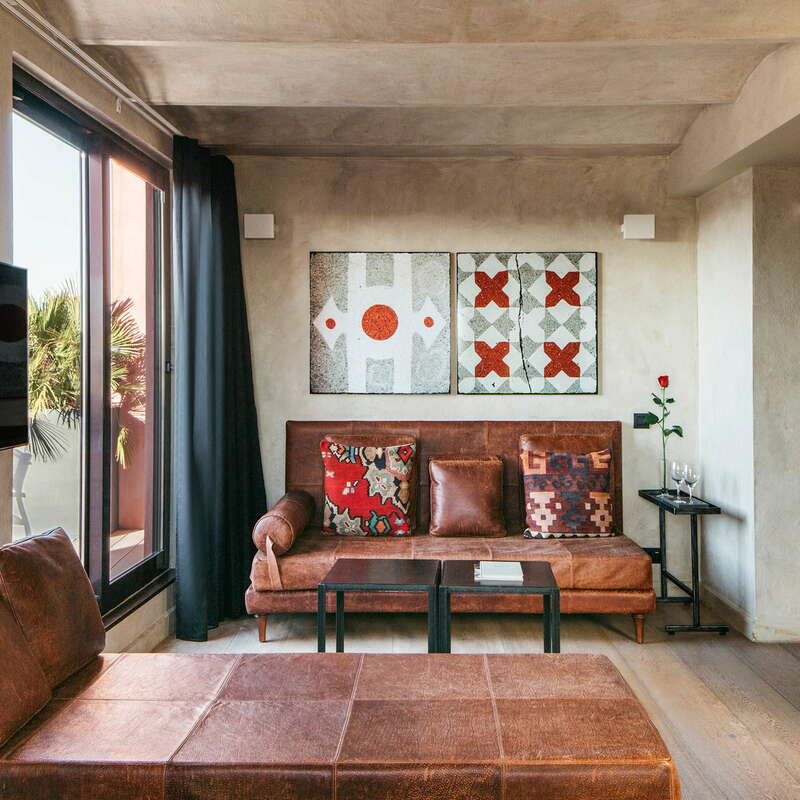 And though each room is different, there are kitchens in all, restored wood furniture and headboards, brown leather sofas, and ancient tiles throughout. 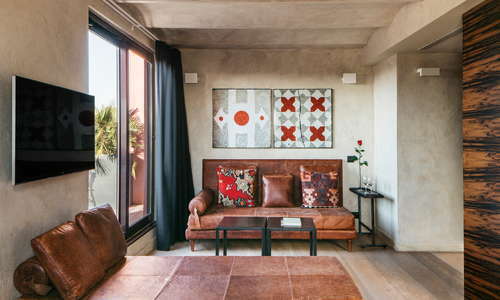 All come with Nespresso coffee makers and one of the suites features a Jacuzzi on a private terrace. If you book on the hotel’s website, you’ll receive a welcome bottle of wine and bottled water. Also, if you call ahead, the hotel will stock your kitchen for you (for a fee). Awash in green marble floors and walls, the bathrooms have modern raised black sinks, and come with shower/tub combinations. The White Company bath products are standard. 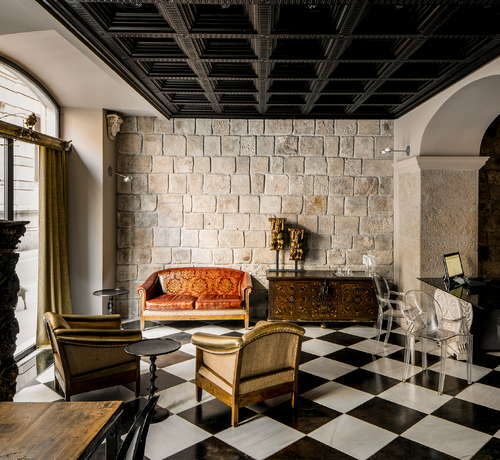 Guests are met by black-and-white-tiled floors as exposed stone, coffered ceilings, and marble pillars give the lobby its ancient essence. There are some work desks and an original white marble spiral staircase as well. 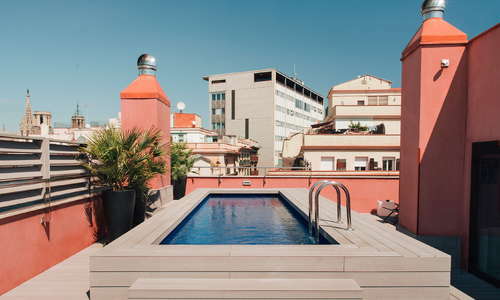 Up on the roof is a small rectangular pool with black loungers atop light wood slats. Views are stunning and you can clearly see Tibidabo, Montjuic, and the Barcelona Cathedral. A tiny gym is open 24/7 and has three cardio machines and some free weights against more exposed brick and black-and-white-tiled floors. Inside the gym is also a sauna. There are two separate dining outlets here – the first is Palosanto, a Mediterranean/tapas joint that’s open for lunch and dinner. The second is Kokka, a unique Peruvian restaurant that fuses with Japanese and Chinese cuisine. YOU SHOULD KNOW Breakfast can only be ordered in the room. Smack dab in the middle of the Gothic Quarter means you can walk through windy, narrow alleys and find some of the best attractions, restaurants, bars, and shops in the city. Las Ramblas, the biggest pedestrian walking street, is just minutes to the west and there’s also a metro stop there if you need to get around faster. Access to the hotel via taxi can be tricky (it’s super narrow through here), but you won’t really have a problem flagging one down on nearby streets. 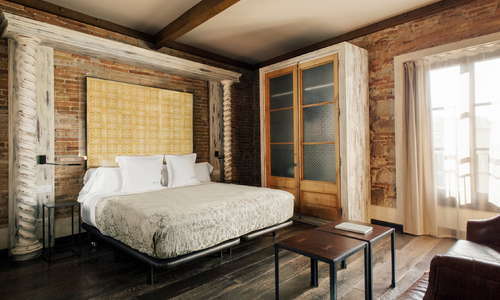 If you’re hankering for excellent Catalan with special twists, head over to The Serras Hotel where inside is Informal (5-minute walk) that’s helmed by a Michelin chef. Seafood fanatics should make it a point to check out ESTIMAR (9-minute walk), which has been serving some of the freshest fish for decades. For live music lovers, you can’t go wrong with the action at Harlem Jazz Club (3-minute walk). If you’re into cocktails, head over to Paradiso (10-minute walk), a fun speakeasy with amazing bartenders. 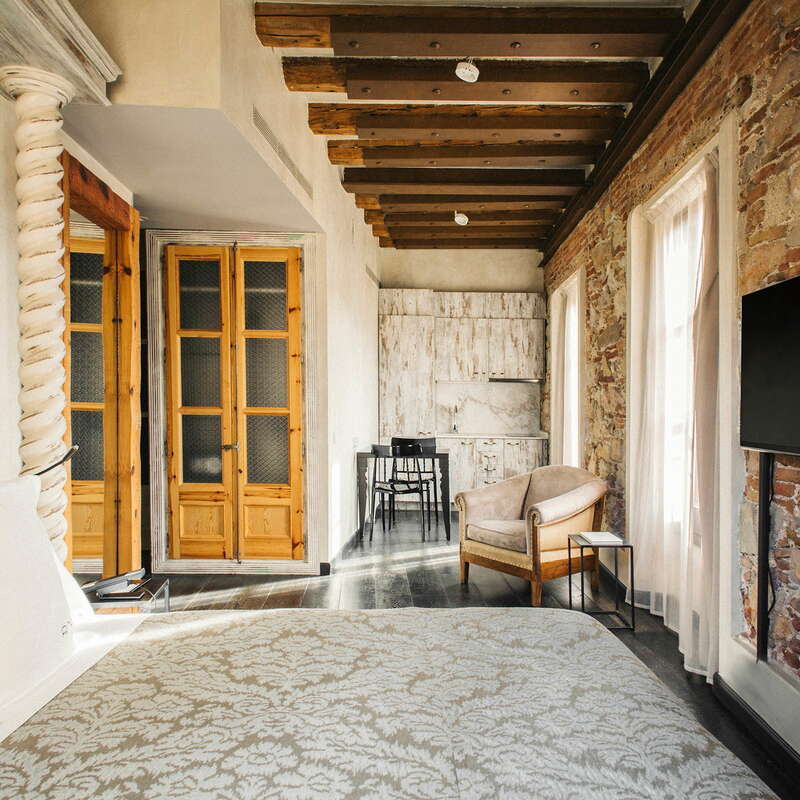 This ancient palace has been converted into a luxury hotel while preserving its heritage in the best ways possible. Because of its petite size (31 rooms), service is extraordinary with a high level of personalization from a remarkably friendly and affable staff. Though it’s small, there are still two wonderful dining outlets, a little gym, and a rooftop pool in case you needed added amenities. 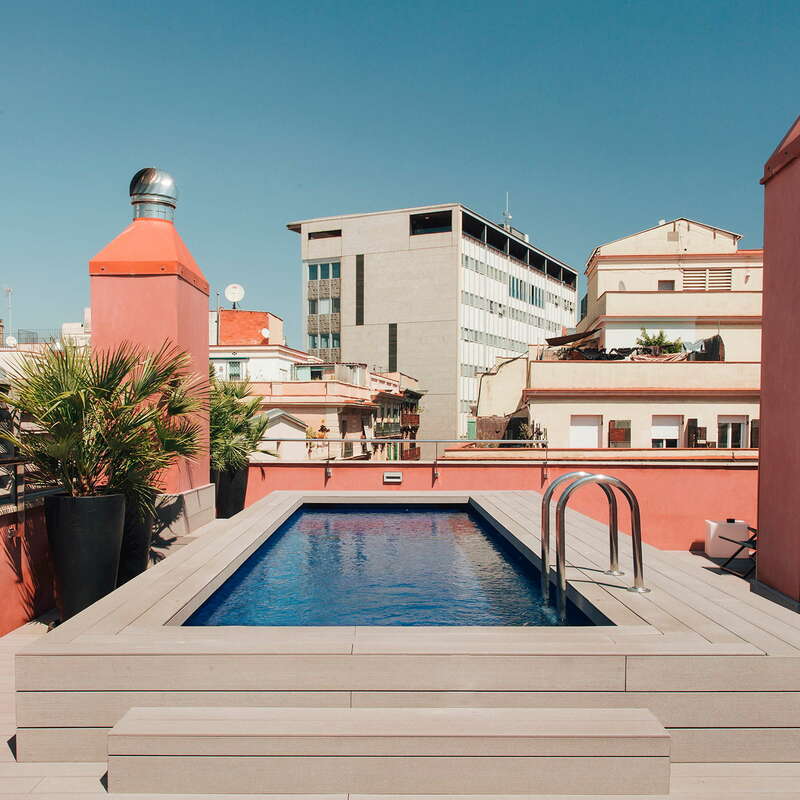 Solid for families and longer term stays, this centralized spot in the heart of the Gothic Quarter gets you assimilated to Barcelona life in a heartbeat.